Malnutrition is a very real challenge being faced by both rural and urban India. Despite sincere efforts by the Government of India in addressing this issue, malnourishment continues to plague a large part of India. The most affected are the women and children and the number of citizens affected with malnourishment is well above a crore. The primary reason for such high rate of malnutrition in the country is definitely poverty and the inadequacy of Government’s development policies reaching the masses. Another equally relevant reason for such high prevalence of malnutrition in India is lack of education and awareness. To address this issue, the Indian Academy of Pediatrics (IAP) in partnership with HealthPhone, today announced the formal launch of the IAP HealthPhone programme, the world’s largest digital mass education programme to tackle the challenge of malnutrition in mothers and children, at the national-level in India. The programme has been launched in partnership with the Ministry of Women and Child Development (MWCD) Government of India, UNICEF and is supported by Vodafone India. IAP HealthPhone is a public private partnership initiative that leverages the increasing penetration of mobile phones in the country to educate over 6 million girls and women between 13 and 35 years of age and their families on better health and nutrition practices by 2018. IAP HealthPhone will achieve its objectives by widely promoting and distributing four re-edited videos from the Poshan series, jointly produced by MWCD and UNICEF in 18 Indian languages. The Poshan videos address issues of status of women, the care of pregnant women and children under two, breast feeding and the importance of balanced diet, health and simple changes in nutritional care practices that can notably enhance nutrition levels. Vodafone will send out approximately 300 million text messages to its subscribers every year to promote the viewing of the four videos. It will also support IAP to undertake a comprehensive communication campaign to promote the IAP HealthPhone programme across the country via print and social media. 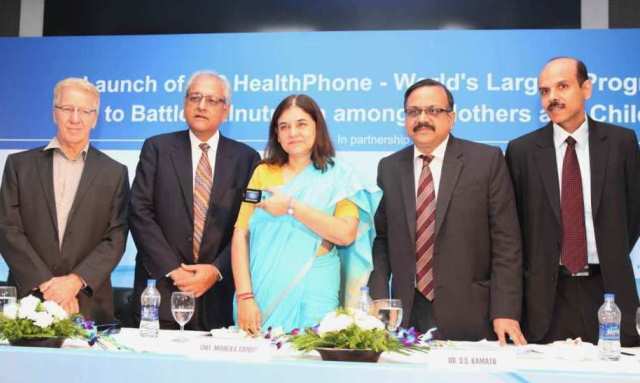 The three-year campaign by IAP HealthPhone is expected to benefit the health of 60 million children in India born by 2025 and will be transformative for India’s fight against malnutrition.